Wonderful quality and goes great with my living room. For the price can't beat it! Very easy to assemble. (Did by myself in about an hour). There was a small hole through the top piece but thankfully in the underneath side. I didn't notice until it was halfway assembled and since it doesn't show I didn't worry about it. Using it in our unfinished basement/playroom area. A little small for my apartment but it's the perfect size for my 40" TV. Easy to assemble and very sturdy. 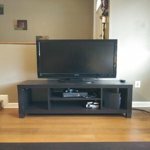 Excellent TV stand for 50 bucks. Would definitely recommend this to a friend. I've owned it for only a week. Very easy setup. Very sturdy so far, holding up extremely well. Looks great!! The price was mind blowing!! 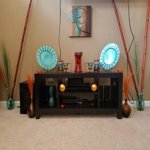 I'm actually using it as a stand to hold my home theater system along with other decor. My tv is mounted above the stand. Very easy to put together and surprisingly sturdy. It was the perfect piece for our family room. Had a few pieces that appear to have been banged up a little before packaging but, it was on sales for $49 so kind of got my money's worth. The damages was barely noticeable all except for the large mechanically made curve mark that went down the center of the top piece but, it was one the bottom so who cares. All in all I'm satisfied. The one small problem with this table is the "wood texture" is actually some sort of paper sticker that covers the wood. When you go to peel off the manufacturer label on the top (not sure why it's dead center on top) some of the brown/black wood texture peeled off. I placed the TV stand over it so no big deal since it was a small spot that peeled. 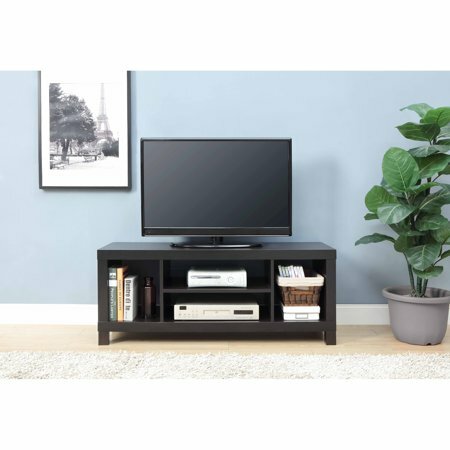 Overall a nice little TV stand that looks good and is built very sturdy. If the sticker didn't peel the finish off I would have given 5 stars. Dimensions per website were incorrect, off by width 6". TV does fit however 1/2" per side left to spare, did not realize until already unboxed. On a few of the predrilled holes screw did not bite, just spun. Good looking product for the price. This item came to me in a very timely fashion but unfortunately had a giant dent that broke through it. Not happy with that. I was sent a damaged item! The package reached me in pretty battered state and the item was damaged! Walmart definitely needs to look for better shipping options.